"In another part of Chicago stood the institute for Nuclear Research, in which men may have had theories upon the essential worth of human nature but were half ashamed of them, since no quantitative instrument had yet been designed to measure it." - Isaac Asimov, "Pebble in the sky", 1958. This was an interesting project; but now it's all done. My conclusion is a bit depressing for the current research; but hey, let's just do it all over again from the beginning :-) Hehe, enjoy! Andersen, S. M. (2004). A Hybrid Neural Network Model of Binocular Rivalry (Final Report). I've dedicated a web-page to the IT cortex. 2.5.03 Neural nets for IT cortex -- Associative memories? Hopfield nets? Grossberg's ART networks? ART FAQ at http://www.wi.leidenuniv.nl/art/ and the "ART Headquarters" at Boston University, http://cns-web.bu.edu/. Hebbian learning is the other most common variety of unsupervised learning (Hertz, Krogh, and Palmer 1991). Hebbian learning minimizes the same error function as an auto-associative network with a linear hidden layer, trained by least squares, and is therefore a form of dimensionality reduction. From the FAQ. A vector of values presented at different times to a single input unit is often called an "input variable" or "feature". To a statistician, it is a "predictor", "regressor", "covariate", "independent variable", "explanatory variable", etc. A vector of target values associated with a given output unit of the network during training will be called a "target variable" in this FAQ. To a statistician, it is usually a "response" or "dependent variable". From the FAQ. The CS41NN - Neural Networks lecture notes might have something to offer? Pantic L.,Torres J.,Kappen H.J.,Gielen C.C.A.M. (2002). Associative memory with dynamic synapses, Neural Computation, volume 14, pages 2903-2923. Pantic L.,Torres J.,Kappen H.J. (2003). Coincidence detection with dynamic synapses, Network: Computation in Neural Systems, volume 14, pages 17-33. An introduction to stochastic neural networks, In: Handbook of Biological Physics, Neuro-informatics and Neural Modelling, volume 4, pages 517-552. Andersen, S. M. (2003). A Hybrid Neural Network Model of Binocular Rivalry (Proposal). Tong, F. (2003). Primary Visual Cortex and Visual Awareness. When searching for IT area stuff, be aware that the LOC (lateral occipital complex) area is considered the homolog of macaque IT cortex (Gross et al., 1972; Sary et al., 1993; Kobatake and Tanaka, 1994). Some DOI-referenced articles can be found through Science Direct. Storkey, A. (1998). Palimpsest memories: a new high capacity forgetful learning rule for Hopfield networks. A manuscript, typically of papyrus or parchment, that has been written on more than once, with the earlier writing incompletely erased and often legible. Storkey, A. (1999). The basins of attraction of a new Hopfield learning rule. Nicolas Brunel (1996). Hebbian Learning of Context in Recurrent Neural Networks. Riesenhuber, M., & Poggio, T. (1999). Hierarchical models of object recognition in cortex. In Nature Neuroscience. 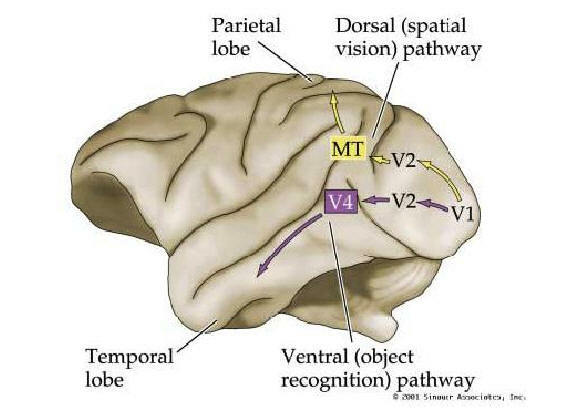 Mechanisms of visual object recognition: monkey and human studies (Tanaka, 1997) In Current Opinion in Neurobiology, 7:523–529. Kanwisher, N., Tong, F., & Nakayama, K. (1998). The effects of face inversion on the human fusiform face area. Tong, F. (2001). Competing theories of binocular rivalry: A possible resolution. Brain and Mind, 2, 55-83. Grossberg's (1999) Laminart model. How does the cerebral cortex work? A diagrammatical figure of LGN - V1 - V2. Grossberg, S. and Seitz, A., (2003). Laminar Development of Receptive Fields, Maps, and Columns in Visual Cortex: The Coordinating Role of the Subplate. Cerebral Cortex, in press. Grossberg, S. and Williamson, J.R. (2001). A neural model of how horizontal and interlaminar connections of visual cortex develop into adult circuits that carry out perceptual groupings and learning. Cerebral Cortex, 11, 37-58. On Binocular Rivalry (BR) in Wired. Steven J. Cox, Boyce E. Griffith -- these guys developed a HH-type neurons model in C++ (maths and pseudo code in article, code supposed to be on the web somewhere). Peter Dayan and Larry Abbott have written a book on theoretical neuroscience, and ch. 7, which just happens to concern network models, is available online. Abbott's homepage is also full of links to pdf's of articles he has written. If you want to look at those and can't read .ps-files, you can find them converted to pdf or html by citeseer or google. Dayan's articles are also available. A look at classical nn's, with MSVSC++ code at generation5, they also have some introductory texts. Chris found some of BR-related articles at MIT's AI lab. O'Shea, R. P., & Corballis, P. M. (2003). Binocular rivalry in split-brain observers. Unpublished manuscript. PDF file (224 K). O'Shea, R. P., & Corballis, P. M. (2001). Binocular rivalry between complex stimuli in split-brain observers. Brain and Mind, 2, 151-160. PDF file (28 K). This seems related: Recurrent Sampling Models for the Helmholtz Machine --> what sort of network do we want to use? This discusses one with recurrent connections. I'm not trying to confuse anyone by putting this stuff here; don't look at it if you don't want to. There are no known differences in fundamental brain mechanisms of consciousness between humans and other mammals. "It is wrong always, everywhere, and for anyone, to believe anything upon insufficient evidence."